Happy October 1st! Halloween's only a month away!!! I didn't get into nail polish until the very end of 2012, so I missed out on Dollish Polish's 2012 "This is Halloween" collection. I love "The Nightmare Before Christmas" so you can imagine my excitement when I saw on Dollish's Instagram that she restocked some of the collection in her Etsy clearance bin. I picked up This Is Halloween, Deadly Nightshade, Vampires Coven, and Spectral Pup. First up is the collection namesake This Is Halloween. 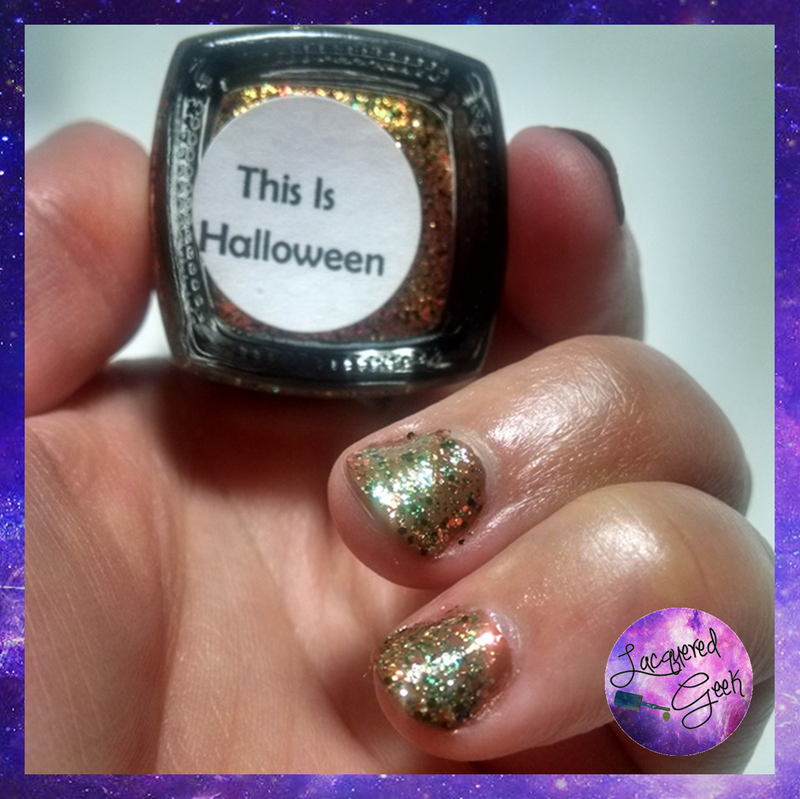 This is Halloween is a clear base full of small gold,orange, green and black glitters. It is just a perfect Fall color - great for Halloween and even Thanksgiving! The formula is easy to work with, and the glitter payoff is fantastic. I'm wearing This Is Halloween over OPI Ice-Bergers & Fries. I really wanted to see what various numbers of coats would look like, so I've got 1 coat on my middle finger, 2 coats on my ring finger, and 3 coats on my pinkie. I can't really tell much different between 2 and 3 coats. I like all the looks though! Next I have Deadly Nightshade. 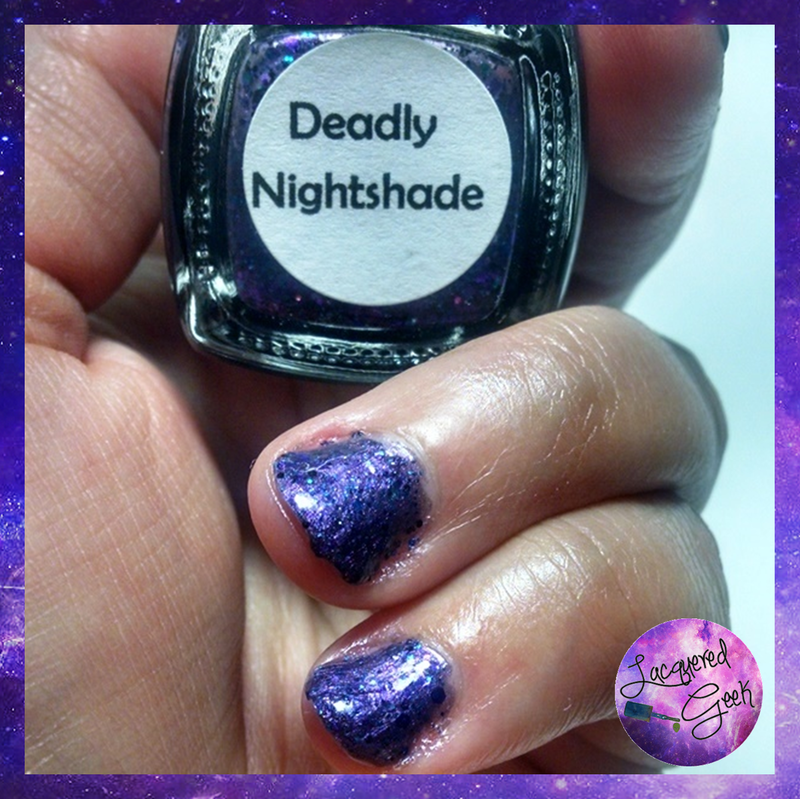 Deadly Nightshade is a gorgeous violet base full of purple, blue, teal, and black glitters. You can layer it over a base, or build it up to opacity. It does start sheer, but as you can you see below, it builds up nicely. This is 3 thin coats topped with a clear top coat. 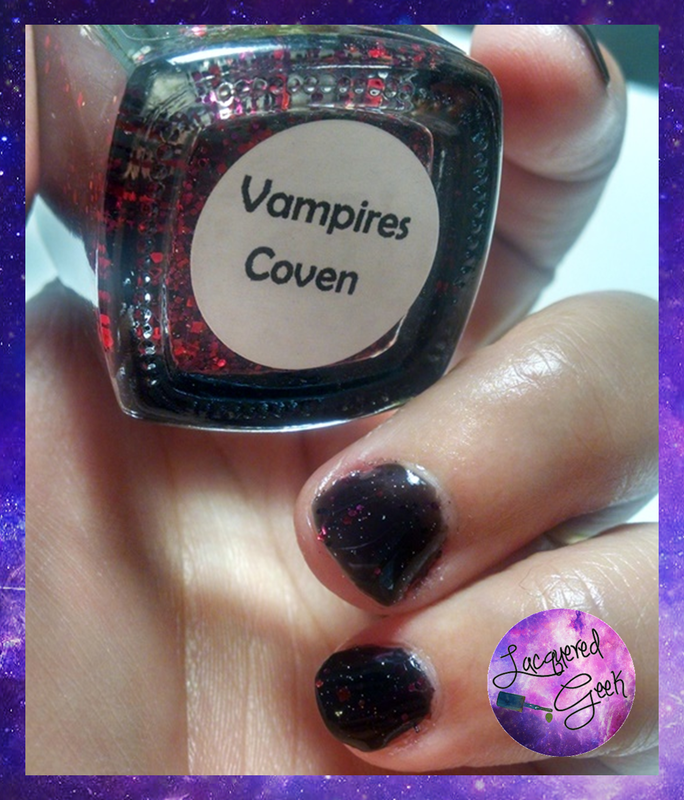 Vampires Coven is a blackened base with red glitters. This one is very sheer. I think it looks much better over black. My middle and pinkie have 2 coats layered over Spoiled "Visually Slimming," while the ring finger had 4 coats on its own. It seemed like even though there was a good bit of glitter in the bottle, it didn't go on the nail as heavy. Finally, we have Spectral Pup. This was by far my favorite of the bunch! 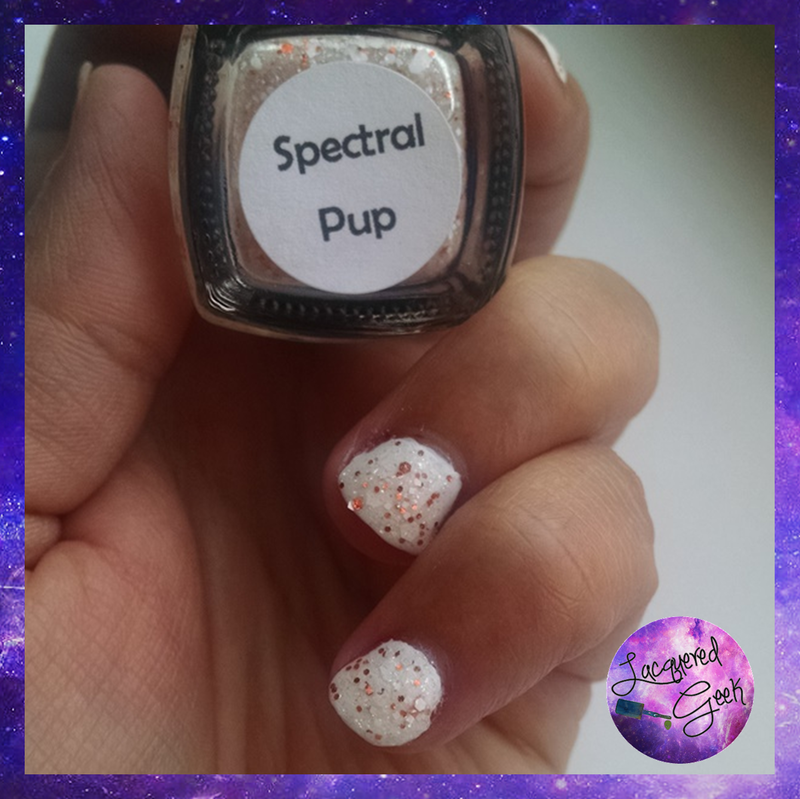 Spectral Pup has a shimmery base filled with orange and white glitters, and here's the best part... it glows in the dark!! 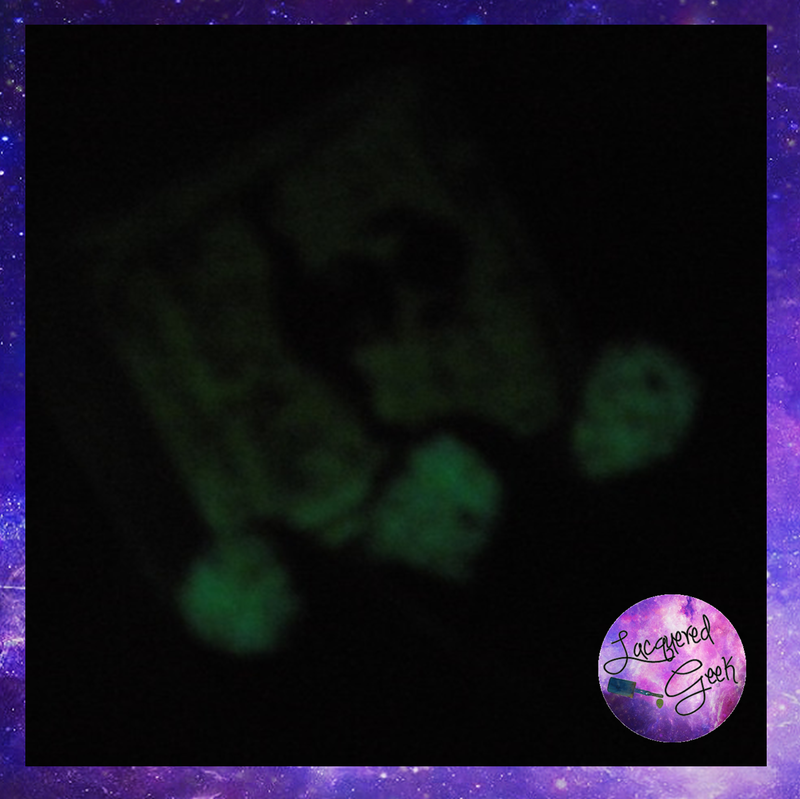 I'm a sucker for glow in the dark polish. This one has a fantastic glow, however I couldn't capture it very well. I layered 2 coats over Sally Hansen "White Out." I brushed on the first coat, and then dabbed the second coat to fill in the glitter. I can't wait to try this over other colors! As this was a clearance bin restock, I'm not sure how many are still available, so I'd suggest running over to the Dollish Etsy shop and check out what's available!! Be sure to also check follow her for new releases, restocks, and sneak peeks! I'm jealous you got these! One of my favorite movies! I love it too! I'd been lusting after Spectral Pup for awhile!